Do you have a cracked iPhone screen? Fortunately, this is a repair that is very common and there are many professional iPhone screen replacement services available. A broken iPhone screen can leave a user feeling frustrated when their device is not working properly. Repairs are free for iPhones still under warranty. If the device is no longer under warranty, you will probably have to pay to have your iPhone repaired. However, there are many affordable and skilled technicians who can replace the screen on the iPhone. iPhones have become an integral part of users’ daily routines. They use the devices to connect with others, and the devices are useful in school and work settings. As a result, iPhone users do not want to be without their devices for a long period of time. Same day service is available for many screen replacement services. These skilled technicians guarantee their work. They also have the right parts in stock to replace the screen on your device. This reduces the amount of time that you will have to wait to get your iPhone back. There are many tutorials and do it yourself kits that show users how they can replace the screen on their iPhone. Although this may seem like a great way to save money on repairs, there is a benefit to using a repair service. Technicians can fully inspect the device and determine if there is additional damage. If you need additional repairs, the technician will have the parts in-house to complete the repairs and return the device to you. However, the technician will not complete extra repairs unless you have authorized the repairs first. 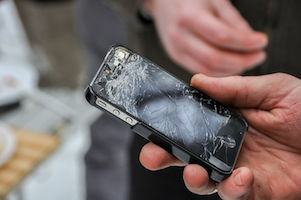 Accidents are unavoidable and unfortunately sooner or later you may inadvertently drop your iPhone. Even though you may be frustrated that your device is damaged, a professional iPhone screen replacement service will make sure that your device looks new and works perfectly after repairs are completed.